Advice on eye drops for dry eyes if your contact lenses are uncomfortable. Many contact lens wearers suffer from dry eye either occasionally or on a regular basis. This is often caused by changes in temperature or the environment. Air conditioned offices, for example, are notorious for giving contact lens wearers horrible itchy dry eyes. While you can carry a small bottle of lens solution around to lubricate your eyes by removing and then re-inserting your lenses whenever they feel dry, this doesn't always work. And that's where eye drops come in. Before rushing out to buy eye drops over the counter from a pharmacist, check for compatability with your contact lenses and existing contact lens solution. Buying the same brand usually helps as the products are manufactured to work together. If you just have mild dry eye syndrome, then re-wetting drops may be enough. For others, eye drops, which are effectively fake tears, may be the only solution. For chronic dry eye sufferers, further measures may be necessary - see our related pages below for more information. The causes of dry eye are numerous. Essentially, your eyes don't produce enough tears for lubrication or the tears evaporate too quickly, leaving eyes itchy and sore; this can happen for example in hot dry weather. Natural ageing, especially during hormonal changes like the menopause. Your body's inability to produce sufficient tears. Dry environments like air conditioned offices. A house that is too hot. Tip: If you walk around in a t-shirt indoors in the middle of winter, your heating is probably too high! Too many hours on the PC - this dries your eyes as you tend to blink less. Side effects of taking certain medicines. Dry eye can be a symptom of certain diseases such as arthritis. See the related pages below for information on which eye drops to choose for dry eyes, plus where to buy them at the best price. 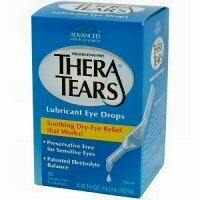 Some of the best known brands are Thera Tears - Highly recommended for chronic dry eye, Similisan - with no allergic reaction for contact lens wearers, Blink - great rewetting drops for RGP wearers and Refresh , value for money moisture eye drops for dry eyes. Caution: Before using any eye drops for dry eyes, check whether the drops can be used while still wearing your contact lenses. Many do NOT - you must remove your lenses, insert the drops, then wait 15 minutes or so before putting them back in.